The Best Books Ever: Stones and Finger Bones by Jessica Minyard ~ Blog Tour Review (by Jaime!) and Giveaway! Stones and Finger Bones by Jessica Minyard ~ Blog Tour Review (by Jaime!) and Giveaway! I started Stones and Finger Bones a little wary, a little excited. I am so happy that the excitement quickly took over, and left the wariness far, far behind! It was a great fantasy novel, with a fantastic world. The world-building alone was a huge part of my excitement, and the magic made it even better. Magic pretty much makes everything better! The writing was a little shaky at times, but I was so involved in the plot, the characters lives, that I can forgive it! Stones and Finger Bones was a dark, magical story with an MC who has not had an easy go of things. Some people will probably not like Aurelia, and I will admit that she grated on my nerves at times, but I appreciated her as an MC, and I understood a lot of her actions. She had some seriously tough decisions to make, but in the end she became a much stronger character. That type of growth is a huge plus for me personally, as a reader. The romance between Aurelia and Rycen was a decent one. I never really got fully involved in THEM, as a story, but the rest of the story was so good that the romance was a backseater for me anyway. 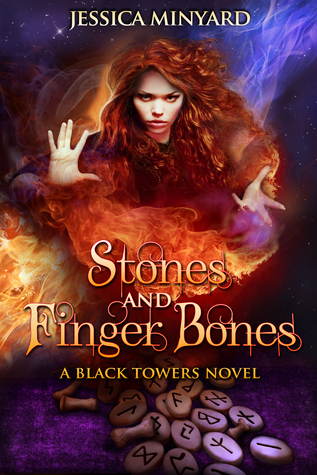 If you like stories full of adventure, darker in nature, with characters who struggle and fight, grow and learn, Stones and Finger Bones is for you. If you like magic, and awesomely nasty villains, this is a book for you. Fast-paced and thrilling, Stones and Finger Bones was an unexpectedly juicy read. I am looking forward to where Jessica Minyard takes Aurelia and this world in another book! Great review, Jaime! I think I'd like Aurelia she sounds realistic for one - not everyone is perfect and if I can understand why they do certain things that would normally annoy me I'm ok with that and they feel more human that way, too! And the fantasy aspect sounds very unique and well done!